The worries about Syria and its chemical weapons stockpile had been there for years, but those worries have come to a head in the 2+ year old conflict with the August 21 attack and another, earlier attack (it’s not clear by whom) that took place back in April. Just like reading about emerging superbugs got me to write a primer on antibiotic resistance, with the Syrian sarin situation I thought a brief overview of chemical weapons might be in order. After all, that’s some science that you don’t want on you. The CDC maintains an extensive list of chemical weapons, 64 compounds and elements that can be used to kill or incapacitate large numbers of people relatively easily. Some of the items on that list might surprise you, because you might come across them yourself in small amounts every day, like nicotine, ethylene glycol (think antifreeze), and ammonia. Abrin. Found in the seeds of the rosary or jequirity pea, and used as an herbal medicine in tropical regions. Ricin. Made from the mash left over when processing castor beans for castor oil. You can actually expose yourself if you eat unprocessed castor beans. Saxitoxin and tetrodotoxin. Found in certain fish (like puffer fish) and other aquatic animals. Lewisite. A blistering agent (like mustard gas) developed for use in World War I, it was never used on the battlefield. 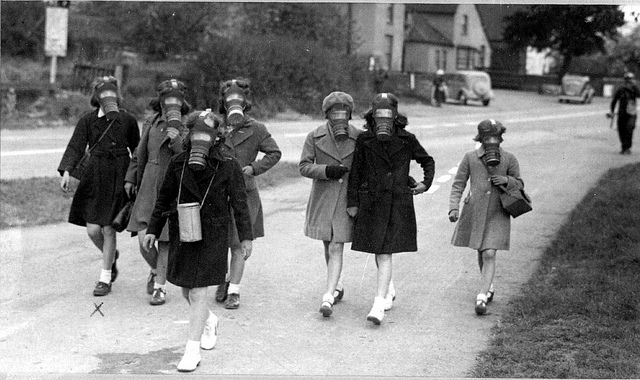 Mustard gas. It actually has nothing to do with mustard. Its name comes from the fact that some think its odor is reminiscent of mustard, though others thing it smells more like horseradish, garlic, and apples. Or you can look at them by what they do. Some, like the aforementioned mustard gas and lewisite, are blistering agents; they cause the skin and mucous membranes (the delicate tissues in the mouth, airway, and around the eyes) to inflame and blister. (Phosgene, a choking agent, works in a similar way.) Others, like to sarin and VX, are nerve agents; they interfere with the biochemical switches that turn nerves on and off, forcing them to stay on all the time, with fatal consequences. Still others interfere with with how cells work. Ricin, for instance, monkeys with protein production in cells throughout your body. And then there are your killers versus your incapacitators, like the “riot control agents” (the official euphemism for tear gas). This group of agents — bromobenzylcyanide, chloroacetophenone, chlorobenzylidenemalononitrile, chloropicrin, dibenzoxazepine, or as they’re known to military and security experts, CA, CN, CS, PS, and CR — also painfully irritate the skin and mucous membranes, but not to the extent of blistering or choking agents. For the moment, let’s turn back to sarin, the gas used in Syria. It’s bad news. Really bad news. Also known by its military desgination, GB, and chemical name, isopropyl methylphosphonofluoridate, sarin was originally developed as a pesticide in Germany in the 1930s. Chemically similar to a family of pesticides called the organophosphates (think parathion and malathion), it’s much more potent. It’s produced from two chemicals, methylphosphoryldifluoride and isopropanol, that have real industrial purposes, which is one reason why prevention of sarin manufacture is really tough. A colorless, odorless liquid, it changes into gas with ease at room temperature, making it easily dispersed as an airborne weapon. Because it disperses so easily, it also doesn’t persist — it comes in, does its dirty work, and goes away. Exposure to a single drop of sarin can be fatal, but it’s still not as potent as the king of all nerve agents, VX. To get a more complete rundown on why sarin and other nerve agents are such heavy hitters, you should read the nerve agent overview by the Organisation for the Prohibition of Chemical Weapons, (the agency that monitors countries’ compliance with the 1997 Chemical Weapons Convention) and/or the sarin summary by the Council on Foreign Relations. And back in May, the Atlantic ran a step-by-step rundown of how sarin revs up the nerves to shut down the body. Scary as all this is, one must remember that human’s aren’t the only species to engage in chemical warfare. What are a skunk’s spray or a snake’s venom if not chemical means of disorienting a foe or bringing down prey? Many of the antibiotics we use today have been used by bacteria and molds for eons to stake out claim to food and space and fight off invaders. I recently read a piece by National Geographic blogger Ed Yong about ants that defend themselves by spraying chemicals into the air from their stingers. But chemical warfare among humans is different. We didn’t evolve it as a means of self defense or to get food. We sought it out, discovering, refining and engineering these compounds a way of killing or sickening either as stealthily as possible or as many of ourselves as possible.